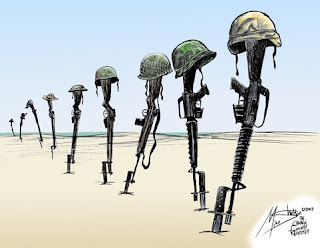 Memorial Day, May 25th, 2009. For some reason, today I find myself being hit with the true meaning of Memorial Day. Maybe the fact that I am at work on this day has something to do with. Well honestly I've worked the past five or six Memorial Days so I don't think that has anything to do with it. I realize that for most Americans Memorial Day is an excuse to have a three day weekend right before the start of June. For others it's an excuse to have a BBQ and drink some beer. 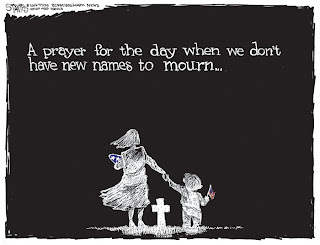 Yet, I find myself wondering today how many people know the true meaning of Memorial Day? Is it a day for great sales and patriotism, no. There is no patriotism requirement for today. Patriotism is often misconstrued with what today is about. There is no law stating you must fly a flag or listen to Toby Keith. I remember as a child my favorite part about Memorial Day was that TNT would show old war movies. Some of my favorite movies are still Battle of the Bulge, Midway, Tora! Tora! Tora!, and The Green Berets. As I grew older it was a day for a BBQ and swimming. While I was in college it turned into a day I either spent working or traveling. For many people the day is spent in various different pursuits. Some play golf, some visit friends, some visit family. Where they visit their family is as different as each and every one of us. For most, today is a happy day. For others though, today is a sad day. Today is the day they remember their friends, their fathers, their sons. This is what we truly honor today. Not the sales or the BBQs, but the men and women who gave the last full measure in service to our country. The men and women who can only be remembered in pictures, videos, and the memories we cherish. Today is the day where fathers and mothers mourn their children. Most Americans will go throughout the entire day without giving a seconds thought to who has sacrificed everything so that we may live today. I pause today and I am grateful. I am forever grateful for the sacrifices of ordinary citizens and the battles they waged. I think about the fields of Saratoga in New York. I see a group of motley clad soldiers in New Orleans. I see the men charging a stone wall across a long green field in Pennsylvania. 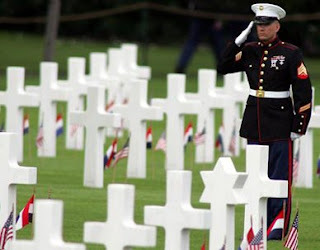 I watch the Marine at Belleau Wood digging his hole and praying he'll be able to walk out whenever its over. I bear witness for the men who stubbornly held in the frozen woods of Bastogne. I am surrounded by the memory of the men who fought and died in the Pusan Perimeter. I see the shattered city of Hue and pray our country has learned to support those who fight, even if they don't agree with why. I remember not seeing my father for most of a year and just hoping that Saddam didn't know what he was doing. I remember watching men roll into Iraq, and wondering how many of them I knew. Today is the day for all Americans, to stop and be grateful, even if for the briefest of moments. Today is the day to say a prayer to whomever you call god, and say thank you for the bravery of those who died in the name of our country. It is a truly a day for giving thanks. Whether it is for the men and women you never met or for the son who last thoughts were of his parents as he lay dying in a foreign country. We stop today to remember all those who make it possible to have our BBQs and our Sales. We honor the dead and those who serve our country today, because it is the least we can do. So pause today, if only for a moment, and bow your head. Think about everything and everyone who has made America possible. Think about what it has cost our country to be a beacon for the world. All you have to say now are two simple words, Thank you. Reasons Why Having Crazy Neighbors Is Annoying. A Night I Won't Soon Forget.